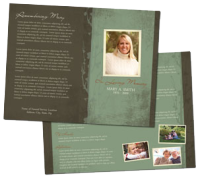 Wondering what to do about sympathy gifts? The tradition of delivering home-cooked food to the grieving family has been carried on for hundreds of years. And it is for good reason. As the family gathers together to plan the funeral or memorial service and deal with their grief, they need comfort food. At a time like this, the family trying to cope with cooking for everyone who has gathered... well it's just not an option. The kindest thing you can do is to drop off a pot of stew, or a pan of lasagne, etc. If cooking is not an option for you, consider delivering some rolls and breads and luncheon meats. It will always be appreciated and one of those things people always remember and are grateful for. Another option is to send a gift basket of goodies. A bit of small town charm. Words cannot begin to describe how much it will be appreciated. Leave a lasting impression by sending any one of these gift baskets - that will warm the hearts of anyone who is dealing with grief. Or consider making your own homemade sympathy gift baskets. This site has wonderful ideas and steps for easy to make homemade gift baskets; www.giftbasketsforfriends.com . 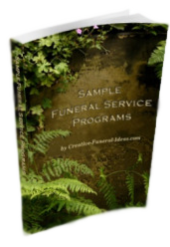 It has a number of bereavement gift basket ideas, including food, teas, wine, and flowers. Back to Tips on how to write a sympathy note. And we have made it easy for you! 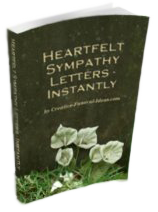 You can quickly and easily write sympathy letters that will make a lasting impression.